Burberry, in the midst of a major repositioning, says that it is “building brand heat,” even as it gains traction selling off the merchandise that reflects its old style. The debut line from new creative director Riccardo Tisci, set to roll out next month, is the first step in its turnaround plan, developed after several years of weak sales. “We are navigating our business between the new branding and vision for Burberry and the previous collection in store that does not yet reflect our new positioning,” the company says in its earnings statement. Comparable store sales rose just 1%, with notable softness in the U.S. Still, Burberry is maintaining its forecast of stable sales for the year ahead, despite the potential complications of a no-deal Brexit on its operations. “While still in the first phase of our multiyear plan to transform and reposition Burberry, we made good progress in the quarter as we built brand heat and continued to shift consumer perceptions,” it says. Sales of the limited-edition B-Series, the first taste of the “new” Burberry, sold well through social media channels, especially in China. 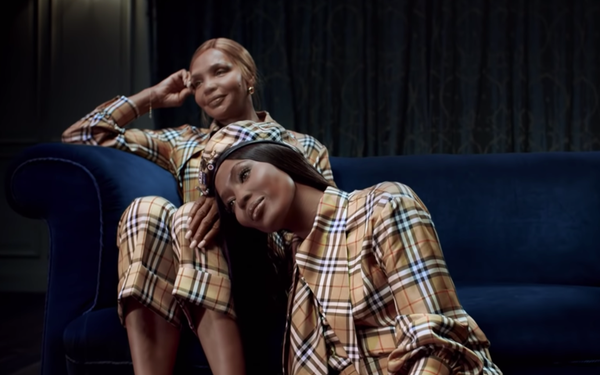 The company says the collaboration with Vivienne Westwood that was launched last month, with the designer’s most recognizable pieces reimagined in classic Burberry plaid, also generated strong demand. Social media gains include the addition of 1 million Instagram and WeChat followers from the previous quarter, and a 50% improvement on WeChat. And the company credits its high-profile holiday marketing campaign, starring the likes of Kristin Scott Thomas, MIA and Matt Smith, with reaching more than 57 million customers. Observers are still somewhat skeptical. “Burberry is making great progress on social media, but we have yet to see this translate into sales results,” says Neil Saunders, managing director of retail for GlobalData.